If you use the computer every day the Mousetrapper Prime is ideal for you. 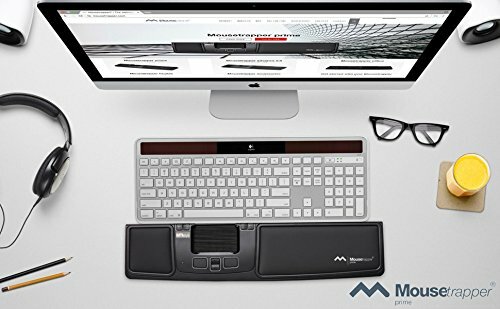 This is an ergonomic alternative to a mouse that prevents repetitive strain injuries and other problems that can occur when you us a conventional mouse. The Mousetrapper Prime has eight programmable buttons so you have plenty of options for configuring your Mousetrapper exactly as you want. It also lets you work wirelessly via USB, and two separate buttons make it easy to scroll and zoom in and out. By downloading the Mousetrapper MT Keys software, you can also easily reconfigure all the button functions, add standard texts and create user profiles to choose functions that you want. The MT Keys software is available on both Mac and PC. Another great feature of Prime is that it has replaceable and wipeable wrist supports, making it easy to clean. It also has a folding keyboard support, which makes it equally compatible with new low-profile keyboards and higher profile standard keyboards. The Mousetrapper Prime is easy to use and makes using a mouse more comfortable. I use the computer a few hours a day so this is ideal for me when I am working. I also found the height adjustment useful and loved the super-slim, ergonomic design. The Mousetrapper Prime has a rechargeable battery and has 6 months of battery life between charges. It is compatible with all PC and Mac computers with a USB port. The MT Keys requires Windows 7 or later or Mac OS 10 or later.